Andalou Naturals has just launched so many innovative, unique products. They've launched a line of Instant Face Masks and a line of Instant Hydro Serum Sheet Masks. Both are absolutely wonderful, with offerings for all skin types. They've also launched a line of konjac sponges. I am a very recent konjac fanatic, and I've finally seen how amazing they are for your skin. Today I want to share three of their new sponges with you. What's Special About Andalou's Konjac Sponges? Just like the rest of Andalou's products, these are made with non GMO ingredients, and they're cruelty free, vegan, and certified gluten free! Plus, these little babies are biodegradable! How Do I Use These Sponges? To use for the first time, you simply soak in warm water for five to ten minutes. Then you can gently exfoliate your skin, with or without a soap or cleanser. Once you're finished, simply hang to dry! After the first use, wet the sponge first before applying to your skin. Which Sponges Should I Use? 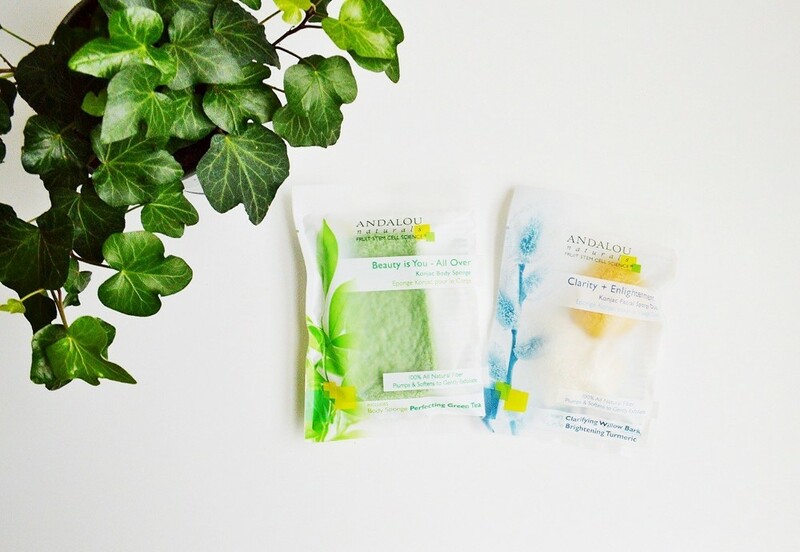 Andalou offers different konjac sponges for different skin types. Today I'm reviewing their body sponge, which I recommend for everyone, with all skin types! I'm also reviewing their sponges for problematic skin, so if you have acne or even acne scars, these will be great for you. Look for more reviews in the future. This sponge is meant to be used all over your body for light exfoliation. It's a dream to use, you just apply your soap or body wash and scrub all over. I love that it has a string so you can just hang it in the shower so it dries properly in between use. While it's mostly natural konjac sponge, this one gets it's green colour from green tea extract, which is fantastic for it's antioxidants. It's going to give your skin a radiant, healthy glow while exfoliating and revealing super soft skin. My skin gets a bit problematic from time to time, so I was so happy to give these a go. They're both incredibly gentle, even for my sensitive skin. They're very effective at exfoliating my skin and leave my skin soft and smooth every time. I use two to three times a week, and I usually follow with a detoxifying clay mask. The white heart sponge is infused with white willow bark, which is going to help reduce inflammation and balance your skin. It's also going to clarify your skin and gently heal acne. They yellow circle sponge is infused with turmeric extract, something that's quickly gaining popularity in the green beauty community. It's great for brightening your skin, while working at reducing inflammation. Have you tried a konjac sponge before? What did you think?